SIR Roden & Lady Cutler Foundation presents its 6th annual Foundation Cup Golf Day on Thursday May 24 at Concord Golf Club on Majors Bay Road Concord. Participate in the Harvey Norman Invitational golf tournament and enjoy a special day at one of Sydney’s most prestigious golf clubs whilst supporting an important and worthwhile cause. Breakfast served at 7am before player briefing and move to tees for shot gun start at 8.15am. Buffet lunch and drinks in clubhouse from 1.30pm. Cost $990 for teams of four includes breakfast, on-course drinks, lunch and prizes while this year by popular demand CARTS will also be provided to all players and included as part of the standard registration fee. The Sir Roden & Lady Cutler Foundation is a charity established in 1999 to assist people in urgent need of transport to meet their medical and health needs. 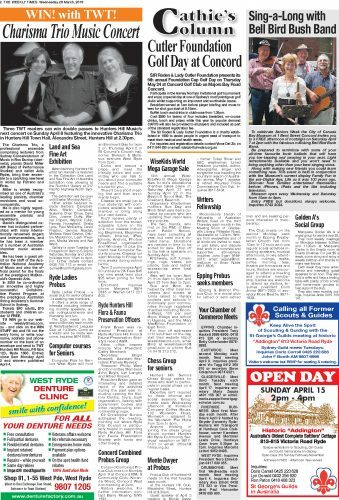 To celebrate Seniors Week the City of Canada Bay Museum at 1 Bent Street Concord invites you to a FREE afternoon of nostalgia on Saturday April 7 at 2pm with the fabulous rollicking Bell Bird Bush Band. Be prepared to reminisce with some of your all-time favourite bush ballads that will have you toe-tapping and swaying in your seat.Ê Light refreshments available and you won’t need to bring anything other than your best singing voice. Along with making new friends you could learn something new. This event is held in conjunction with the Museum’s current display Family Fun in the pre-Digital Age, Life as it was 100 years ago. Discover how families entertained themselves before iPhones, iPads and the like, including television. Museum open every Wednesday and Saturday from 10am to 4pm. Entry FREE but donations always welcome. Inquiries 9743 3034. Award winning Hunters Hill artist Ian Hansen is featured in the Collection One Land and Sea Fine Art of Australia Exhibition now showing at the Rochfort Gallery at 317 Pacific Highway North Sydney. The exhibition will be open until Easter Monday April 2. Other artists featured include Barbara Campbell-Allen, Martin Campbell, Susanna Chen Chow, Dana Dion, Joanne Duffy, Werner Filipich, Warrick Fuller, Pamela Honeyfield, Sheila Lyne, Paul McCarthy, David Preston, Gemma Rasdall, Mellissa Read-Devine, Debbie Mackinnon, Leah Thiessen, Marika Varady and Nat Ward. Ryde Ladies Probus – a social club for senior citizens – is seeking new members. It offers a wide range of interests including interesting monthly speakers, social outings,luncheons and friendship and fun. The Club meets on the second Monday each month at Ryde/Eastwood Leagues Club at 10.30am. Come as a visitor and be made welcome. Inquiries 9874 5088. Computer Pals for Seniors West Ryde will hold an Enrolment Day for term 2 on Thursday April 5 in St Columb’s Church hall, corner Dickson & Bellevue avenues West Ryde from 2pm. Come and secure a place and meet the friendly tutors and committee who can talk to you about your computer needs and find a suitable course for you. There’ll be a short meeting first and then enrolments begin. Classes are small (up to four students) with computers available for each member or bring along your own device. You’ll receive plenty of attention from the knowledgeable tutors in the one hour classes including Beginners, Beginners refresh, Internet, IPad, Iphone, Android, Photos/Files/Email organisation and Windows 10 plus the brand new Computer Security course. Classes run each Monday to Friday for nine weeks during school terms. Term 2 commences April 30 until June 29. Fees $45 per nine week term plus $25 when joining for first time. Enrolment enquiries phone Margaret 9874 2645 or Warren 0417 221 603. Frank Breen was re-elected President at Ryde-Hunters Hill Flora & Fauna Preservation Society’s recent AGM. Treasurer: Phillip Ward and Committee Members: John Boyle, Lyn Langtry and Alfred Vincent. President Breen gave an interesting and detailed report of the activities during the past year including opening the Visitors Centre, tours, bush regeneration, liaising with government bodies and other neighbouring environmental groups. Clr Christopher Gordon addressed the meeting, pointing out where Ryde City Council is particularly helpful in supporting Ryde Hunters Hill Flora and Fauna Preservation Society with funds and other means. Concord Combined Probus Club meet on Monday April 9 at Concord RSL & Community Club, Nirranda Street, Concord West commencing at 2pm. Visitors welcome. For further information contact Barry Mealing 8765 1581. The 13th annual WiseKidsWorld Mega Garage Sale for kid’s educational charities takes place on Saturday April 21 and Sunday April 22 in the Beecroft Scout Hall, The Crescent, Beecroft. Organisers Cheltenham mothers Sue Day and Bindi Shah said items donated by people who are updating their decor were very popular. The two friends, who met on the P&C of Beecroft Public School, have been collecting all year, but need more donated items. Donations are needed in time to be sorted for sale. Drop off to the hall is available on Sunday April 15. Kitchware, soft furnishings, rugs, vases, pot plants, toys and ladies’ accessories were best sellers. Sale will be open April 21 from 8am to 5pm and April 22 from 9am to 2pm. Sue and Bindi are helped by other local volunteers and donate all funds raised to literacy projects and schools in chronically poor communities through registered charities including Room-to-Read, 100 per cent Hope Village and school in Uganda, and the Mary MacKillop Foundation in East Timor. For drop off addresses or to volunteer on the day, visit their website http://wisekidsworld.com, email Bindi at [email protected] or phone Sue on 0418 213 212.
at the Hunters Hill Club, Madeleine Street, Hunters Hill at 9.30am. Guest speaker at April 3 meeting is Monte Dwyer – former Today Show and ABC weatherman turned freelance journalist, author, videographer, singer and songwriter now travelling the country in search of Australian stories. May 1 speaker is retired Mounted Police Commissioner Don Eyb. Enquiries 9817-5434. The Club meets on the second Monday each month in Epping Presbyterian Church hall from 10am to 12 noon and runs regular social activities including speakers, musical afternoons, movie attendances, outings, walks, coffee morning teas, theatre performances and tours. Visitors are encouraged to attend a meeting and consider membership. Ladies are welcome to attend as visitors. Enquiries president Colin Jones 9871-2933 or secretary Ross Beattie 9871-1838. 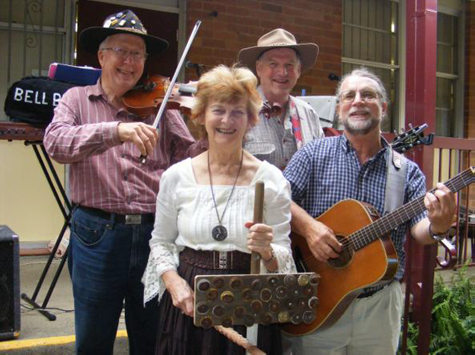 Macquarie Golden A’s is a social group for seniors over 55. They hold weekly meetings on Mondays between 9.30am and 11.30am at Macquarie Centre in the Events room at Events Cinemas. For just $5 a week, come along and enjoy a weekly catchup and chance to make new friends. Each week they have entertainers and interesting guest speakers for an hour. They also hold a raffle and have a trading table with plenty of bric a brac and home-made goodies to help support the club. They also have monthly outings. Enquiries Anita 0415 815 141.